The aid package for Greece must tackle the root causes of the country’s economic weaknesses, European Central Bank Vice-President Lucas Papademos said on Tuesday. Papademos, a former head of the Bank of Greece, said financial market pressures on Greece had intensified despite the country’s promises to clean up its public finances and support for the reforms from European Union policymakers. Greece asked for emergency aid on Friday and is currently in talks with the European Union, the International Monetary Fund and the ECB on the terms of the deal. "It is essential that the economic programme currently being prepared by the European Commission, the ECB and the IMF together with the Greek authorities specifies comprehensive fiscal measures and structural reforms that will address the root causes of Greece’s fiscal imbalances and structural weaknesses so as to ensure the sustainability of its public finances and improve the country’s international competitiveness," Papademos told a European parliament committee. He urged all euro zone countries to stick to EU budget rules, warning that fiscal imbalances were not expected to see a discernible improvement until 2011-2012. He also warned that some fiscal repair plans did not have enough detail or were based on over-optimistic assumptions. correction of the excessive deficits, according to the Council’s deadline, at risk," Papademos said. The ECB initially voiced strong opposition to IMF involvement in any rescue plan for Greece. Fears raised included sending the wrong message about the stability of the euro to the IMF, compromising the ECB’s position. Papademos echoed ECB’s President Jean-Claude Trichet’s most recent comments that the combined EU/IMF aid deal for Greece was a "workable solution." He also said he did not expect there to be a clash of interests between the IMF and ECB in any joint decisions. "I believe there will not be difficulties in reaching a common position." 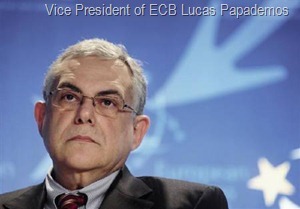 Presenting the ECB’s 2009 annual report, Papademos said inflation in the 16-nation euro zone was expected to remain moderate, risks to the outlook were broadly-balanced and the ECB’s current 1% record low interest rates were appropriate. ECB Governing Council member Axel Weber, who also heads Germany’s central bank, last week warned that short-term inflation risks, although low, were tilted to the upside. Inflation jumped to 1.4 percent in March from 0.9 percent in February. Papademos, whose ECB term expires at the end of May, also played down the risk of Greece’s debt woes destabilising the euro zone’s banking system. "Overall we do not expect this to be the case." However, he did have a separate warning for banks. "It cannot be excluded that over the coming year, as a result of the moderate economic activity, loan losses or write-downs on bank loans will continue to increase."